I first saw a bowl cut using concentric angle rings several years ago. It was done on a machine named the Ring Master. It was a cool tool but a little pricey. At some point later I saw a scroll saw book by Patrick Spielman that showed the same angled rings but they were cut using the scroll saw. I'm not sure if Patrick invented the technique but he was the first to publish it. I gave it a try and made a vase. I have also made a few bowls over the years. In 2009, Carole Rothman took the technique to a new design level and published two books through Fox Chapel. The bowls she designed were beautiful and I highly recommend you take a look a them if you find this technique interesting. 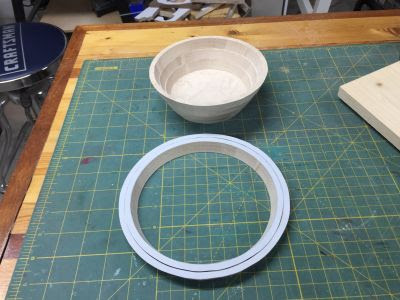 I designed this bowl pattern to produce a 7 inch diameter bowl with thin walls. After sanding the walls will end up about 1/8" thick. I just like to look and feel of the thin walls. Here is a pictorial showing the technique. Prepare the wood blank. 8" X 8" X 1/2" thick. We have to cut the rings at an angle. It's a simple trick to determine the angle. The pattern has 1/4" wide rings. 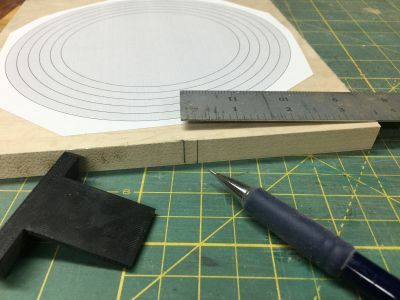 Use a pencil and draw two lines 1/4" apart on the edge of the board. 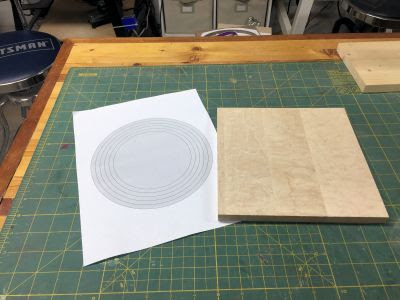 Lay the wood blank behind the scroll saw blade. Tilt the saw until the blade runs from the upper left to the lower right like the picture above shows. That will then be the correct angle. We also need to drill the starter holes at the same angle. Cut the end of a scrap board at the angle you just set the saw to. 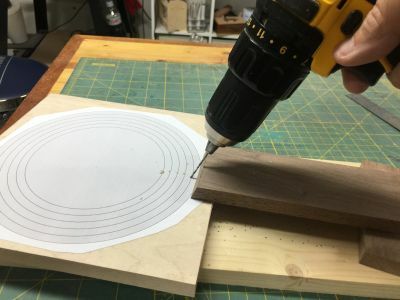 Use the board as a guide to drill all the holes. It does not have to be perfect but the sanding is easier the closer you get the holes. 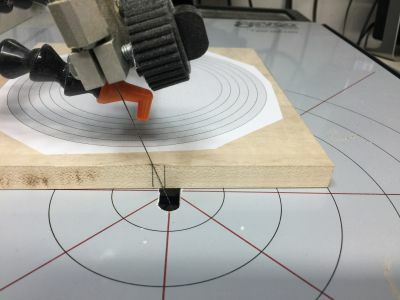 Cut all the rings with the scroll saw If you set the tilt like the photo above then you will cut the rings in a counter clockwise direction. When you reverse stack the rings they will form a bowl. If everything looks good we are ready for the glue up. Apply a water proof glue to each ring. 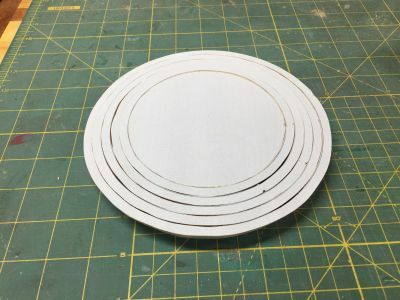 Stack the rings carefully and do not glue on the bottom. We will glue on the bottom after we have the interior rings sanded. It's easier to sand without the bottom. 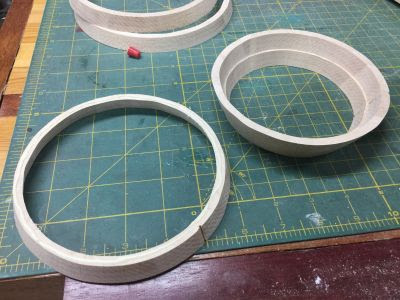 Use power and hand sanding to make the rings flush and smooth. This is the part of the project that take the most time and work. 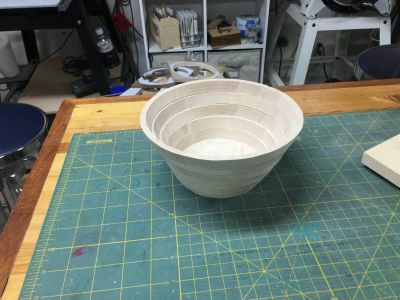 Sanding the interior of the bowl is the biggest challenge. I use a flexible shaft sander with an inflatable bulb sander. I also use a spindle sander. 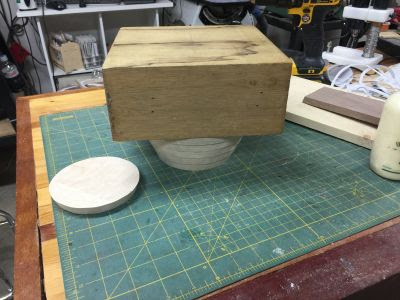 Use what you have but this is a very tough project to make without good sanding tools. Finally glue on the bottom and sand it flush. Finish as desired. I am about two days out on returning orders right now. I you order today I can probably have them ready for you to start cutting this weekend. I'll do my best to get them out early Saturday. We have almost 700 entries already. Remember to enter every day for the best chance to win. 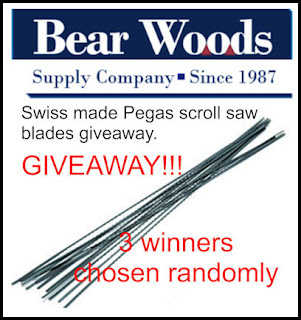 Please support our giveaway sponsor Bear Woods. This is one of the books I mention in the post. The book is written by Carole Rothman. She designs some beautiful bowls and take the technique to a new level. Worth every penny. 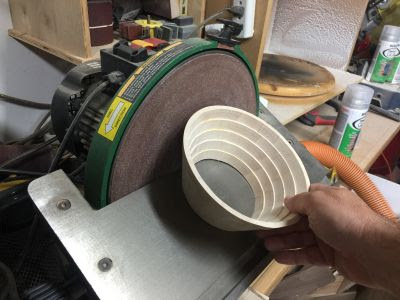 Making wooden bowls has always been considered a "serious" woodworking project because you need a lathe and woodturning know-how. But, thanks to cake-decorator-turned-woodworker Carole Rothman, you can create amazing bowls, vases, candy dishes, and jars with just a flat piece of wood and your scroll saw. 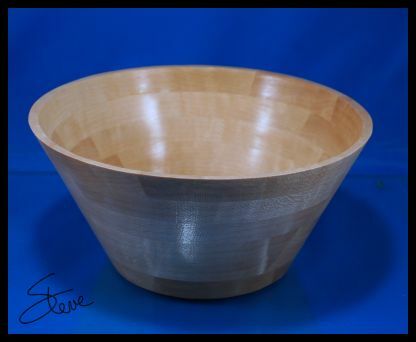 Her easy-to-master techniques and clean patterns will quickly take you from basic bowls to beautifully laminated pieces. 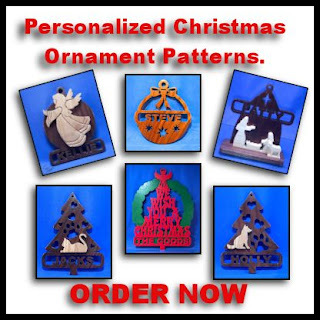 You'll learn how to work with thin wood, contour with sanding, and create a variety of different shapes. 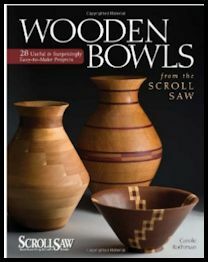 With 28 projects to try, a useful guide on choosing the proper wood and supplies, and a section to help you create your own designs, this groundbreaking book is a must-have for any crafter or scroll saw enthusiast who wants to make stunning and useful works of art.